In addition, we will be undertaking the planning for our school improvement goals for the next five years for BRVGS. Stay tuned for details on these and other events in the near future, and happy New Year to our BRVGS students, staff members, parents and communities! 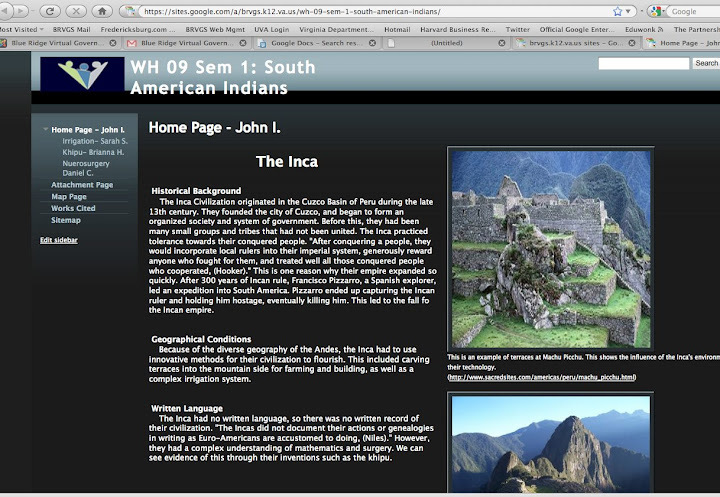 The 9th grade students of the BRVGS World History classes have recently completed a group website project, in which teams of students from different BRVGS schools feature the most important inventions (as determined by the team) of different historical civilizations. The teams were grouped geographically into two different sets of schools for logistics - Orange, Greene and Madison (otherwise known as "OGM") students created one set of sites, while the Fluvanna, Goochland, Louisa and Nelson ("FGLN") created the other. Click on BRVGS Website Voting to find links to the voting forms. Voting will be open until 10:00 AM on December 30th. Each set of schools (OGM and FGLN) will have winners in each of those categories, and winning groups will receive prizes once all voting is done. We encourage friends, family and the public to take part in recognizing the accomplishments of our World History Students this semester! Students of Blue Ridge Virtual Governor's School Biotechnology classes from Fluvanna, Greene, Madison and Nelson Counties took part in the Chesapeake Bay Foundation'sVirginia Watershed Education Program during the first week of November. Depending on their location, students spent the day in canoes on the Rivanna River, James River or the Charlottesville Reservoir. Students performed water testing and caught and counted macroinvertebrate organisms to determine the water quality. BRVGS students from Louisa, Orange and Goochland will take part in similar trips in the spring. To see a slideshow from the recent trips, click on CBF TRips Fall 2011. BRVGS will hold informational meetings for parents and students who are interested in applying to enter BRVGS in the 2012-13 school year. Current eighth graders who plan to be enrolled in one of the BRVGS member districts for next year, and who will have completed Algebra I prior to ninth grade, will be eligible for entry into BRVGS. 9th grade students may apply to enter in 10th grade, if any open slots will be available in the student's local school. Please contact local middle school guidance offices or BRVGS Director Marc Carraway (email: mcarraway@brvgs.k12.va.us cell: 434-989-3972) for any questions regarding these meetings or the application process.